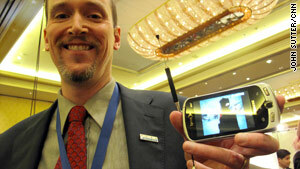 John Godfrey, of Samsung, shows off a demo mobile phone that can pick up and play local TV. Las Vegas, Nevada (CNN) -- The 2010 Consumer Electronics Show doesn't officially kick off until Thursday, but some forthcoming gadgets, including tablet-like wireless devices and phones that can show live TV, are already getting buzz here. Hundreds of tech journalists packed a hotel ballroom Tuesday night for sneak peeks at dozens of new products, some of which won't hit stores for months. The crowds were thickest around such hot gadgets as 3-D TVs, although quirkier devices, such as a radar gun that can fit in your pocket, got some love, too. It's a netbook AND a tablet! Lenovo, makers of the popular ThinkPad, unveiled a hybrid device that's part small laptop, part tablet. Called an IdeaPad U1 Hybrid, it looks, at first glance, like yet another stylish netbook, with its rounded design, shiny paint and Windows 7 operating system. Tug on the screen, however, and it detaches from the keyboard to become a stand-alone tablet that runs on a separate processor. The tablet has an 11-by-6-inch multi-touch screen that can display up to six panels at the same time, so you can check the weather while updating your Facebook status. Lenovo says the IdeaPad's tablet will run on 3G and Wi-Fi networks and have up to eight hours of battery life. The company expects the device to hit the market in the latter half of the year -- probably after the expected spring launch of Apple's much-rumored tablet -- and be priced under $1,000. Samsung showed off a potential hit in the smartphone category on Tuesday: A version of its Moment mobile phone that can play local TV live and on-the-go. Mobile TV has been big in Asia for some time now, but regulatory changes mean that it's just now leaking into the U.S. market. Samsung hasn't committed to selling the mobile-TV-enabled phone in the U.S. yet, however. The company plans to give 300 phones out to guinea pigs in the Washington D.C. area first to see how U.S. consumers react to the idea, said John Godfrey, the company's vice-president of government and public affairs. That test should happen in the first quarter of the year, he said, and may determine how Samsung moves forward. Godfrey did not comment on whether the Moment phone with mobile TV would be more expensive than today's model. The upgraded phone features a 3.2-inch screen for watching video and a removable antenna to pick up local TV signals. Hey parents -- want to time your Little Leaguer's fastball? Or how about that obnoxious neighbor who always speeds down your street? A company called Pocket Radar has made what it claims is the world's only pocket-sized speed radar device. The gadget is about the size of a cell phone and, at $249, is much cheaper than the bulky radar guns used by baseball scouts and traffic cops. It supposedly uses a Doppler radar signal to accurately measure the speed of any moving object up to 375 mph. The Pocket Radar folks hope it will appeal to NASCAR fans, Olympic skiing fans and anybody else who wants to get more out of watching sports in person. "It changes the fan experience," said spokesman William Ostedt. "We're all fascinated by speed." The Pocket Radar runs on two AAA batteries and is expected to hit the market in March, just in time for baseball season. For those who don't want to wait for mobile TV to come to smartphone or who don't want to buy a phone when it does debut, the Tivit may be a solution. The cute, credit-card-size device pulls down mobile DTV signals and sends them to the iPhone, Blackberry or Droid over a Wi-Fi connection. A company called Valups produces the device, which should sell for about $100 when it becomes available in April, said Anne Schelle, executive director of the Open Mobile Video Coalition, which was promoting the Tivit and other mobile TV gadgets on Tuesday. Phone users will have to download a Tivit app to play the live video. A demo on Tuesday night showed iPhones hooked up to one of the devices and streaming TV. Expect mobile TV to also come to a number of gadgets soon, including portable TV players and gaming consoles like the Sony PSP, Schelle said. "Connected TV" and "smart TV" are two terms that already are being tossed around CES this year. Both refer to the idea that couch potatoes are looking for ways to get the power of the Internet and social media onto living room television sets. Enter Boxee, a company trying to make it easier for people to surf through mountains of online video in one sleek interface. The company started on the Web by collating TV from sites like Hulu and Amazon into a Web interface. Now they're headed for living rooms with the Boxee Box, which is expected to sell for $200 starting later this year. In addition to pulling in Web video, the small, cube-shaped device, which was on display Tuesday, also connects wirelessly to home computers, music catalogues and online social networks like Twitter and Facebook -- allowing TV watchers to chat about their favorite programs, even as they're happening. The Boxee Box, which is made in partnership with D-Link, also will feature a remote control with a QWERTY keyboard on the back. Company spokesman Andrew Kippen said that feature is needed because on TV screens, using a standard remote control is "the bane of peoples' existence." A new Boxee interface also will debut in beta testing on Thursday, Kippen said. The most eye-catching gadget at Tuesday's press preview event may have been the AR.Drone, a flying toy that syncs with an iPhone or iPod Touch to create an unusual gaming experience. Made by Parrot, a French company, the device is about twice the size of a Frisbee and hovers quietly above the ground, propelled by four rotors and an on-board computer. Users steer the Drones with iPhones, which act as remote controllers. Several Drones hovered almost motionlessly above the floor of the hotel ballroom Tuesday, surrounded by curious people snapping photos. A camera mounted on the AR.Drone sends a live video feed to the iPhone, meaning that you see what the Drone sees. (If you wanted, for example, you could send your Drone to spy on your neighbor's yard.) Parrot is creating augmented-reality video games for the open-source device and is encouraging outside developers to do the same. The company expects the AR.Drone to cost less than $500 when it goes on sale this summer.